We grow what we love and what we find to do well in our climate. Cacti and succulents are our primary plant focus though other native plants add to the mix. We propagate, responsibly collect, and grow our plants in Oak Cliff/West Dallas. Shad was born in the Arizona desert cradled by saguaro and fed by the nectar of agave and sotol. He is an aficionado of mezcal and lover of cacti and succulents. His keen eye brings vintage pots, planters, and outdoor furnishings to the Corral. Oak Cliff Vintage, located at 443 W Davis in Dallas,is his store specializing in 20th century furniture, art, decor, and industrial remnants. Cacti and succulents from the Oak Cliff Cactus Corral are available at Oak Cliff Vintage. 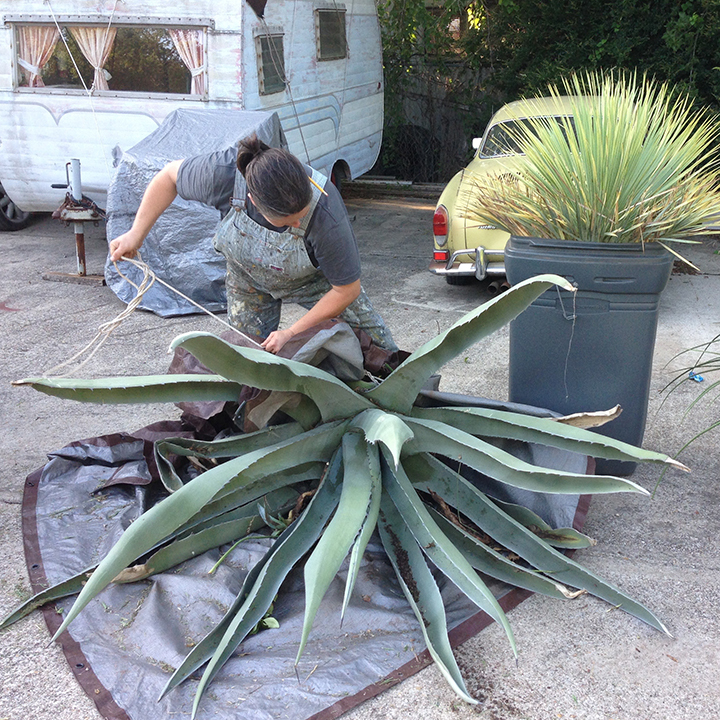 Wrangler of all things pokey, Kim loves water-wise and native plants, particularly agave, sotol, yucca, and cacti. "I grew up in a house with huge spanish dagger in front that flattened many soccer balls and vowed to never have plants that could stab me but I finally succumbed." Her plant collection now grows in many directions. Born and raised in Texas, Kim has ridden many a tumble weed across Texas contemplating its ever-changing landscape and in search plants and perspective. She is an artist, see kimcadmusowens.com, and a professor at the University of Dallas in Studio Art.